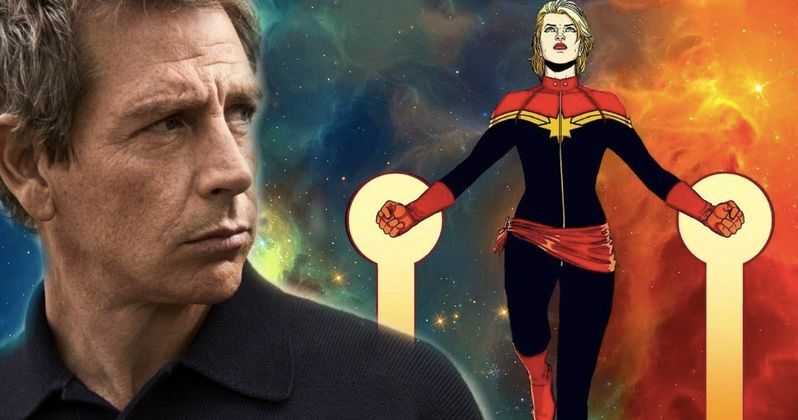 The cast is starting to come together for Marvel Studios' Captain Marvel, with Brie Larson (Carol Danvers) recently being joined by Ben Mendelsohn as the villain and Jude Law as the iconic Kree superhero Mar-Vell, a.k.a. Dr. Richard Lawson. As is often the case with Marvel villains, the identity of Ben Mendelsohn's character is being kept under wraps, but a new report may have just revealed who this character is. If you don't want to know the identity of this character, there will be potential SPOILERS below, and although this report has not been confirmed, you should still read on at your own risk. If you're still reading, that means you do want to know who Ben Mendelsohn is playing in Captain Marvel, and if this report is accurate, he'll be playing Yon-Rogg. This report, citing an unnamed source close to the production, claims that, even this close to production starting, there is "very little set in stone" for the movie, although Ben Mendelsohn has agreed to the role. The source wouldn't go into details about the production process, only that "there are still a lot of moving parts," but it still seems that filming is slated to begin sometime next year. With the casting of Jude Law as Mar-Vell though, it does seems to make a lot of sense that Ben Mendelsohn will play Yon-Rogg. Yon-Rogg was created by writer Stan Lee and artist Gene Conlan, making his debut in Marvel Super Heroes #12 in December 1967, the same issue that marked the first appearance of Kree superhero Mar-Vell, Una and Zarek. Like Mar-Vell, Yon-Rogg was a Kree warrior, a military commander who is in charge of the ship known as the Helion, which was sent to Earth by the Kree's Supreme Intelligence. In the comics, Yon-Rogg's powers include super-strength, agility, and stamina, along with hand-to-hand combat, but perhaps his greatest weakness was his envy of the success of others. Mar-Vell was among those on the Helion sent by Supreme Intelligence to watch over Earth, but the jealous Yon-Rogg tried to sabotage Mar-Vell, to win the heart of the Kree medical officer Una, which lead Mar-Vell to flee to Earth, where he took on the alias of Dr. Walter Lawson, a recently-deceased scientist Mar-Vell came across, before he met Carol Danvers. It was Yon-Rogg's attempts to kill Mar-Vell that ultimately lead to Carol Danvers acquiring the Kree abilities that would turn her into Captain Marvel. Carol Danvers was the head of security at the Air Force base Lawson worked at, and the explosion of a Kree device fused her DNA with Kree DNA, leading to her transformation into Captain Marvel. This report also claims that the original script, which was worked on by Nicole Perlman (Guardians of the Galaxy) and Meg LeFauve (Inside Out) contained a version of this story from the comics, but there have been rewrites on the script since then so it isn't clear if that part of the story is still intact. Anna Boden and Ryan Fleck (Half Nelson, Mississippi Grind) are directing from a script that was recently re-written by Geneva Robertson-Dworet, who later confirmed that she isn't starting over from scratch and that she will be working from the original draft by Nicole Perlman and Meg LeFauve. Marvel has set a March 8, 2019 release date for Captain Marvel, which makes it one of the few movies arriving between both Avengers: Infinity War (May 4, 2018) and Avengers 4 (May 3, 2019), along with Ant-Man and the Wasp. This report comes from That Hashtag Show, which hasn't been confirmed by Marvel Studios at this time.